Thank you all for more than 150.000 Downloads. I would like to thank all the people who gave me donations. It means a lot to me. I guess you want to stay anonymous but if you like to be named, please write me a PM. Additionally, the style of the moon label can be changed independently for better visibility. Furthermore, the vertical offset is now customizable. 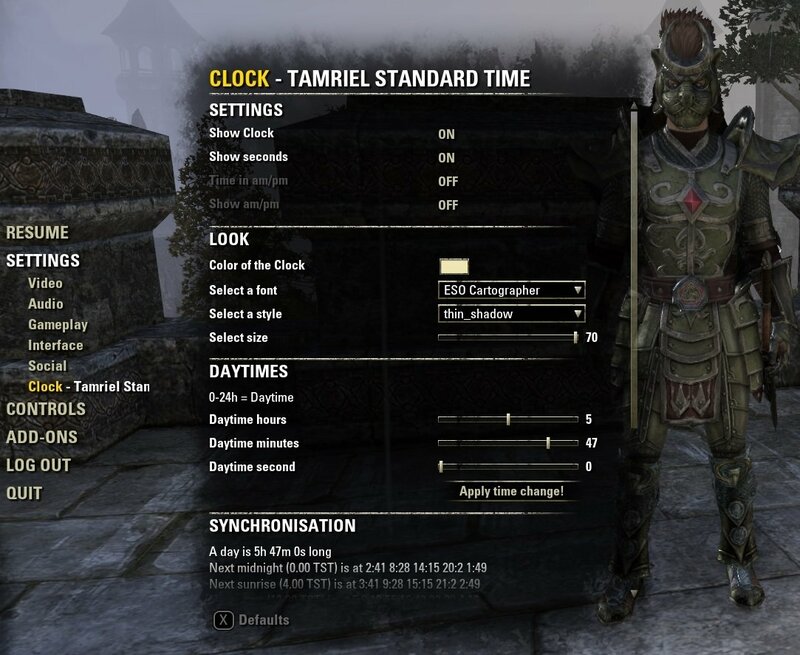 This addon Clock - TST adds a completely customizable and moveable label to the game which shows you the current date and time of Tamriel and of Earth (linked to your system time, thus it is accurate where ever you are). Additionally, it also shows the current state of the moon and the remaining time to the next phase. With update 0.7.6 comes a Japanese translation thanks to @BowmoreLover from the ESOUI community. Together with the new localisation, Clock can now set to show 0 am instead of 12 am at midnight with the 12h setting. Since 0.7.2 also with Russian localisation! (next to English and German). With Update 7 a new background feature was added. The Clock - TST never looked that good before. Check it out. 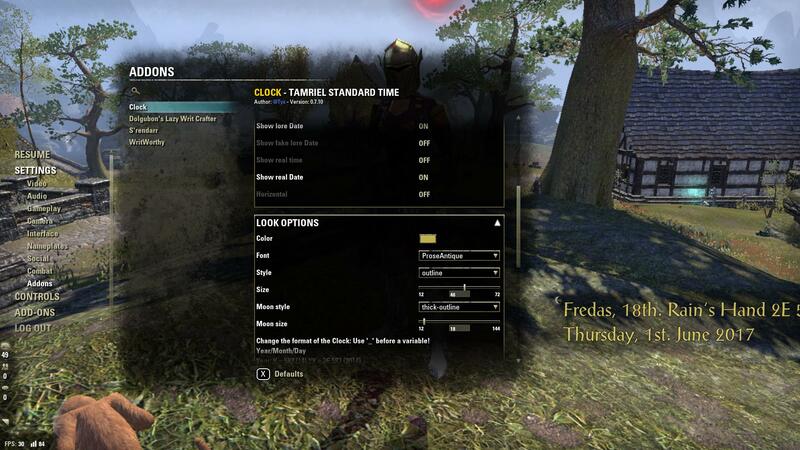 Additional to that and a few bug fixes, you can now have your real time next to the Tamriel time instead of beneath. 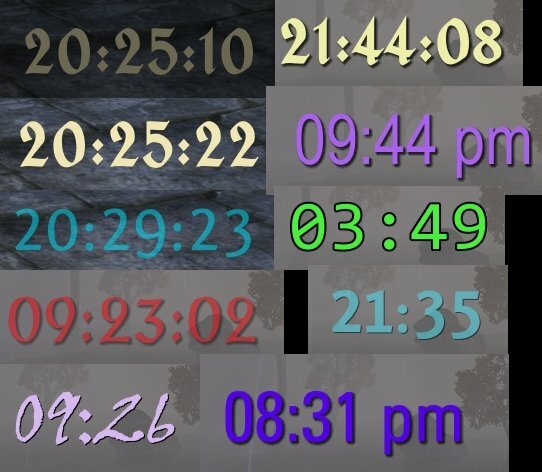 You can use this addon together with Harven's Dwemer Clock to get the in-game Time as a fantastic looking, animated clock. 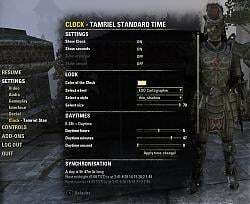 Install both addons then right-click on the Dwemer Clock and click "Use Tamriel Standard Time Clock" option. You can change the size of the Dwemer Clock by clicking on it (left mouse button) and then scrolling with your mouse wheel over the Clock. Check out kerb9729's Addon for Clock - TST: Midnight. It will show you the time until midnight. I will release every stable build here as soon as possible! 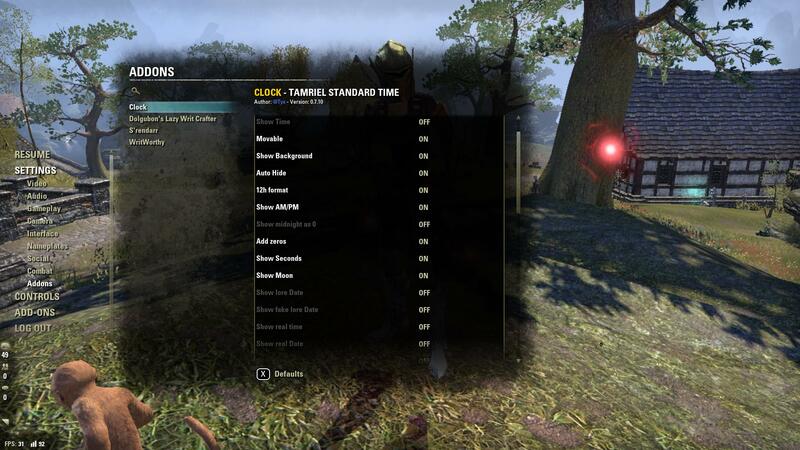 This AddOn will show you the current time in Tamriel. It is displayed on the Interface wherever you want it to be - completely movable. You are also able to set the size, font and style of the clock to your liking. 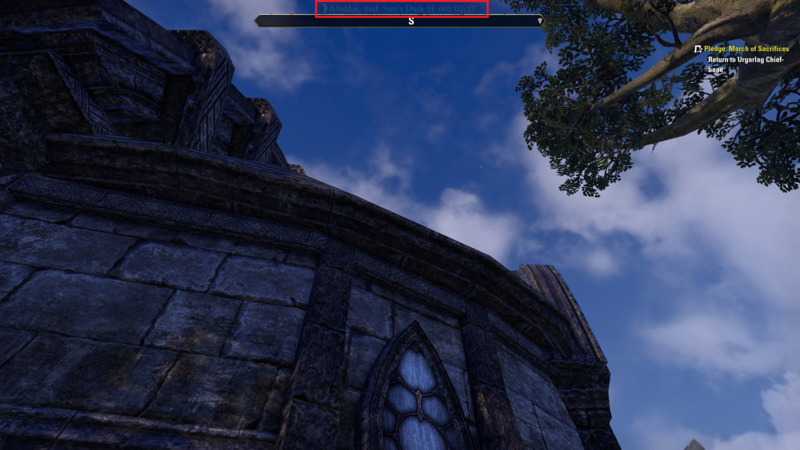 The time in Tamriel is not a fact. There is not function in the API which gets us the length back. Many people right now are trying to figure out how long a day is. 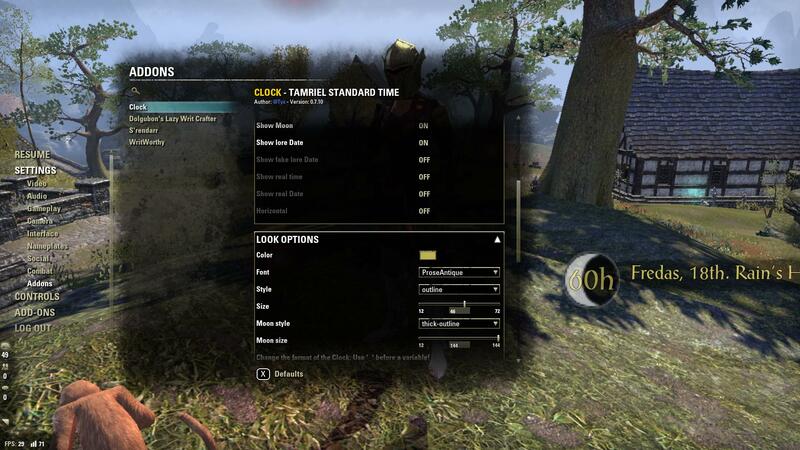 Zenimax Online stated in their FAQ that the time is a bit less than 5h, but after many tests, I am sure it is 5,83h long. If you agree with me or not is up to you. You are able to customize the length of the day easily in the Clock - TST settings. This can be done to a precision of seconds. The time could be off after a maintenance or something else. With the settings menu or commands you can choose one out of four times to synchronize the clock. For example, you see the sun right under your South needle of the compass. You are sure that it is noon right now. No problem: Just write /cl noon in the chat or use the "Noon is now!" button in the settings to sync your clock. 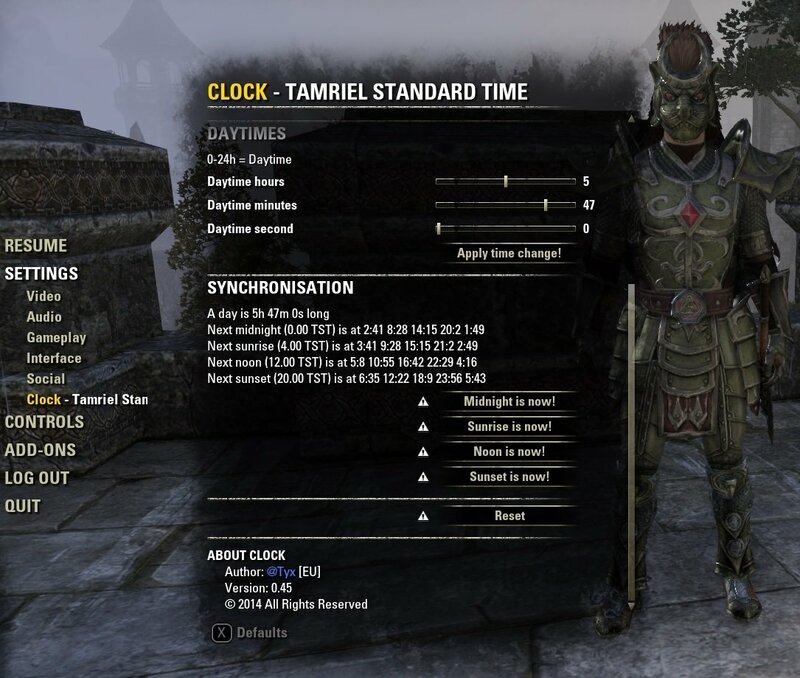 The best way to sync your Clock is to set the clock to noon at noon and wait a day or more (in-game). Then set your time (at noon again) so that your clock shows exactly 12:00. So just wait until the sun is right under you South sign at your compass. Right now, the settings and the Clock is localized in English, German and Russian. If you are from the US or any other country which uses a 12-hour clock, you are able to change the clock to that format too. You can even hide the am/pm signs. Of course you can use the formats: 12h or 24h wherever you are from. You can also hide the 0 before a single number: 01:12 -> 1:12. I personally love to see the seconds pass by. It is fun to see if they reach the zero or step over it (because of the game to real time ratio). It is like the screensaver of a DVD player... you have to watch for some reason. If they distract you too much - like me - or you just don't want to see them, just disable them. You can disable to show seconds in the settings menu. You can let the Clock AddOn show you the current moon phase and the time to the next one. This feature is like the time not based on a fact but on an adjustable algorithm. 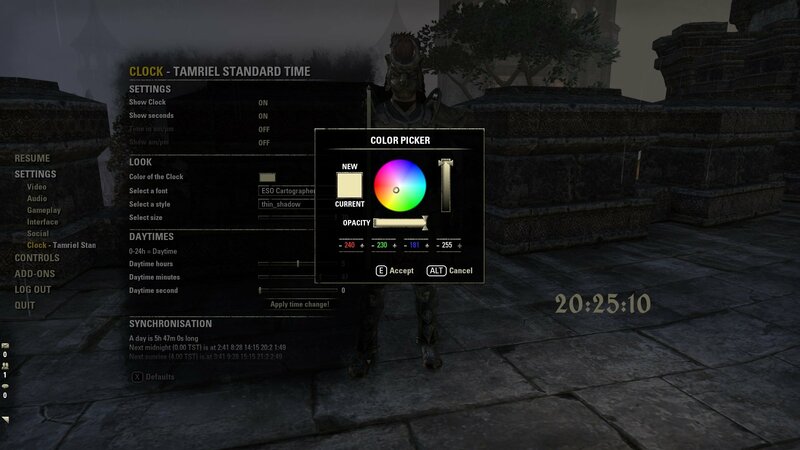 After many months of studying it, I am sure the one cycle is 30 Tamriel days long, but you can still change the length of the different phases. You can customize the length of a moon phase at the settings menu. Clock does not stop there. You can also let the Clock show you the current lore date on your screen either as a real calculated date or a fake one representing the current real date as a lore date. The look of the time and date are fully customizable. 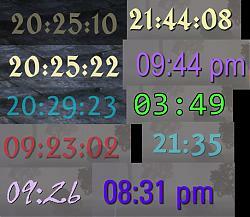 If you want the Clock will also show you the current real date and time as customizable as the lore time and date. Clock - TST gives you a fully customizable lore- (and real-) date and time system with moon cycle integration. If you want a new feature to be added too, feel free to suggest it here. The panel can be called with writing the command /clsettings in the chat. 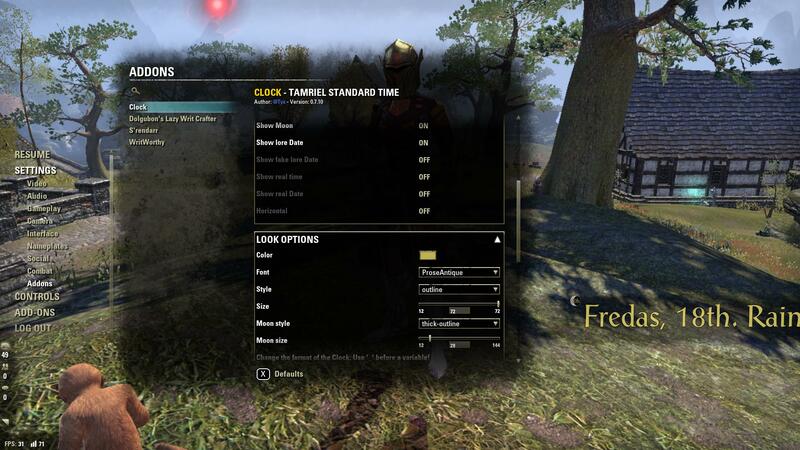 Or To open it press "esc" -> choose "settings" and look for "Clock - Tamriel Standard Time". If it is too much of a hassle for you, there are also chat commands. If you notice one please use this link to report it. 0.6.0+ will only be improvements and bug fixing. Thanks to Harven I don't need to provide you with a custom animated Clock. He made already a really beautiful one compatible with this addon. I am really thankful to the Community of ESOUI which helped me a lot in the forum and the comments or per PM. Special thanks to Seerah for helping me out and giving us the LibAddonMenu, LibMediaProvider and LibStub which I use in this Addon. Fifish, Kenza and of course Garkin. 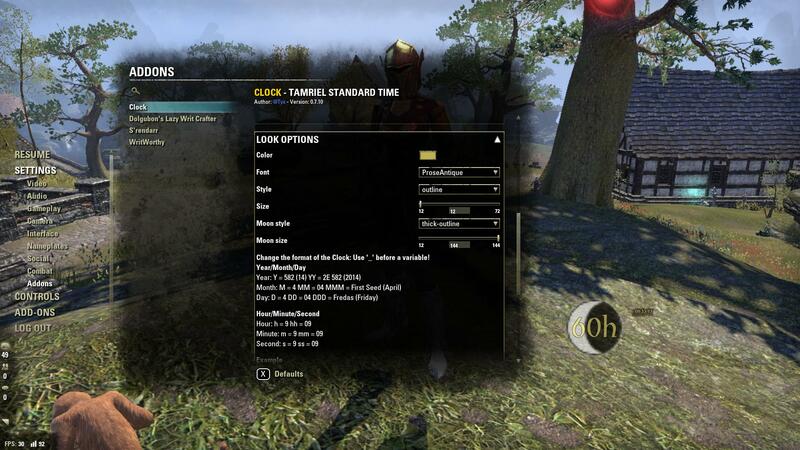 This Add-on is not created by, affiliated with or sponsored by ZeniMax Media Inc. or its affiliates. The Elder Scrolls® and related logos are registered trademarks or trademarks of ZeniMax Media Inc. in the United States and/or other countries. - Updated LibAddonMenu to the latest Version. - 12 am/pm and 0 to 12 12h-time bugfix (thanks to the ESOUI Community for telling me about it). - Tested with update 2.5 (Shadows of the Hist). - Tested with update 2.4 (Dark Brotherhood). - Updated LibMediaProvider and LibAddonMenu to the latest Version. Thank you very much Garkin and sirinsidiator (who took over for Seerah if I understood correctly) for updating these two. - Tested with update 2.3 (Thieves Guild). Big thanks to kerb9729 for updating Clock when I was not around. 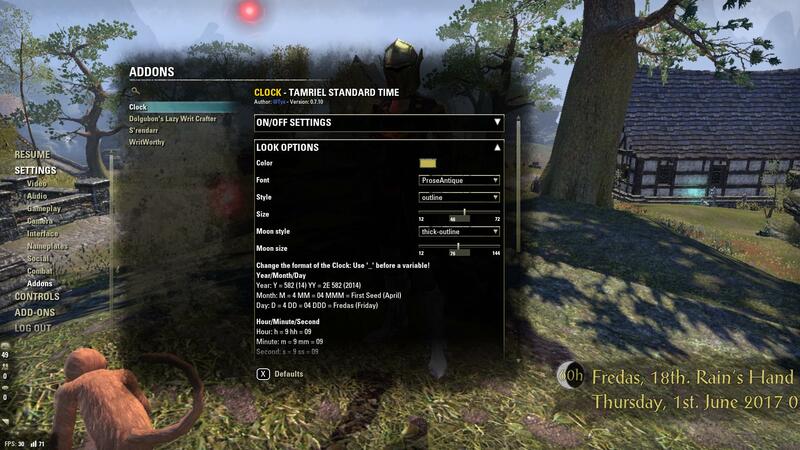 Check out his Addon Midnight for Clock - TST. Thank you very much Seerah for these two. - Tested with game version 5. Thanks for the bug report and testing this Version Jigen. - fixes a little bug where the Clock would disappear when AutoHide is off and you open the settings menu. Thanks to WatersMoon110 for reporting it. "Middas 2nd, Sun's Dusk, 2E 602 03:17"
Moons are Full, 94% full." I think this is good. Features I would like to see: configurable key to toggle everything, hidden when NOT in the character menus. I second the addition of a preference to only have it show in menus. Taking it a step further, I'd like the ability to have it only show on the map screen, so it can show next to the clock that's already there (if possible, of course). Please do API bump and LAM update to remove the annoying "out of date" status! Sure thing. Warning should be gone now. It would be nice if this was done again if possible? Thanks in advance. 2: Open the file "Clock.txt". 3: Search for the line "## APIVersion: ". 4: Change the API version to "100024". So many corpses. So little time. Last edited by Helldir : 08/22/18 at 02:24 PM. Hello, I really like the Clock add-on, especially the Moon phases. But I want to configure its output in some ways that I might prefer instead of the default. What is the "fake lore date"? How is it different from the (real?) "lore date"? Is there any way to "synchronize" the in-game month with the Gegorian calendar month(s) shown in the above table? Is there any way to "synchronize" the in-game weekday with the current weekday on the Gregorian calendar? Thank-you for your time and attention to this inquiry. Last edited by Shadowshire : 01/14/18 at 01:34 AM. 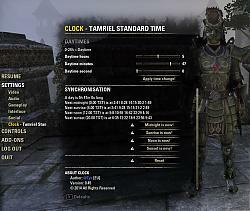 I've used the Horizontal setting to display the system time after the Tamriel time on the same line. If I don't turn Horizontal On, then the system time shows at the start of a line with a blank line between the two. I display the output line above the Compass, since I've never seen anything else there on the HUD. However, apparently, if the name of the day and/or of the month is longer than a certain length, then the system time is "pushed" to the right. As a resulit the system time can become displayed on the line below the primay one. This interferes with displaying the Compass below. Can you change this so that the entire output of Clock will remain displayed on one line? Thanks for the add-on. It adds context and a frame of reference to the game HUD that I enjoy. I was playing around with it and I think I found a bug; Changing 'Style' will change both the moon text and clock text, but changing 'Moon style' does nothing (as far as I can tell). Big thanks for testing and reporting back. It is alway very helpful to get a bug report and yeah, it was a bug. Updated the Git. Didn't find anything myself. Thus I will release it here in the next couple of days. Version 0.7.11 is ready to be tested @Github. Moon offset is working great for me, and so much easier! Yay! It adds the feature of changing the y-offset of the moon manually. Last edited by Tyx : 06/02/17 at 10:59 AM. Ah, so it must just be a matter of personal preference, those all look off to me because I'm trying to make the moon vertically centerd with the text. Yeah, I made the moon intentional higher than the text (when same sized), but now that we understand each other, I can implement a solution. Maybe more see it the way you see it. Will include an option to align the moon with the text in the next version. shouldn't be too hard. Only the offset must be reduced. Last edited by Tyx : 06/01/17 at 02:42 PM. Ah, so it must just be a matter of personal preference, those all look off to me because I'm trying to make the moon vertically centered with the text. But if those look fine to you, don't worry about it~ I'm still happy with the addon and don't mind changing the few lines to adjust my own copy! but I don't do it for any reason than the fun of programming and seeing a product work as planned.